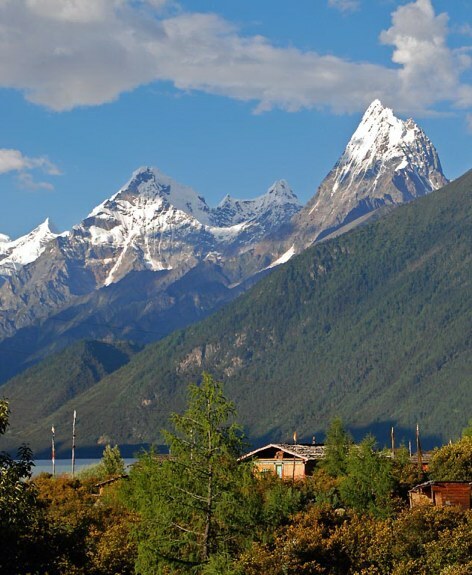 We flew into Gongkar, drove down the Yarlong Tsangpo Valley into Kongpo, where we explored Nyingchi and Pome Counties. 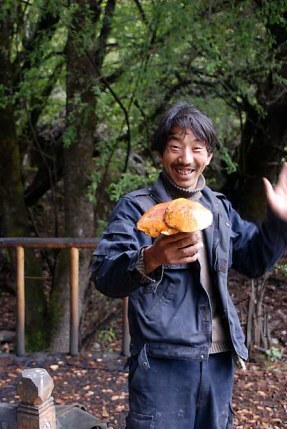 We stayed with a Tibetan family in Tashigang, joined them for a mushroom hunt and mushroom cooking. We visited beautiful Draksum Tso Lake and forayed in the old growth forest. 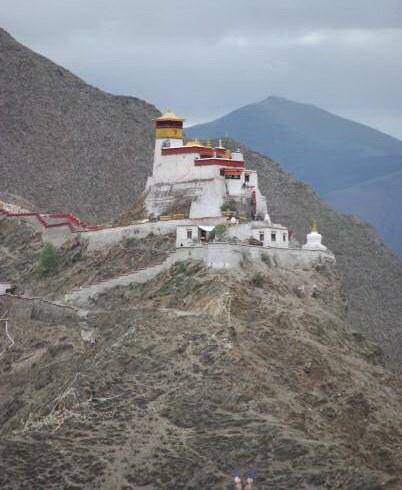 The tour culminated in Lhasa visiting the mighty Potala. One of many impressive peaks around Draksum Tso Lake. 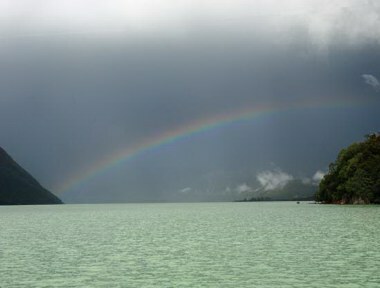 Rainbow over sacred Draksum Tso. 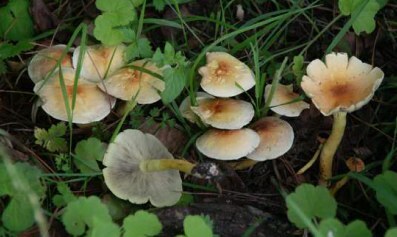 Hygrophorus russula is a local favorite in Kongpo and elsewhere in east Tibet. Boletus reticulatus growing next to an evergreen oak trunk above Lunang. Within an hour of arrival at Gongkar Airport, we came across an "Ongkor" ritual , a harvest festival, in Ora, Gongkar County. Everybody is dressed in their finest and in a great mood. Villagers meet to get ready to circumambulate the fields of the village. 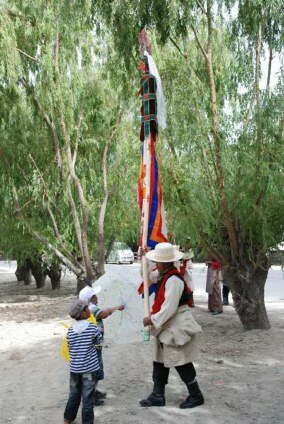 A tall pole decorated with flags is used to carry a barley offering in the procession. 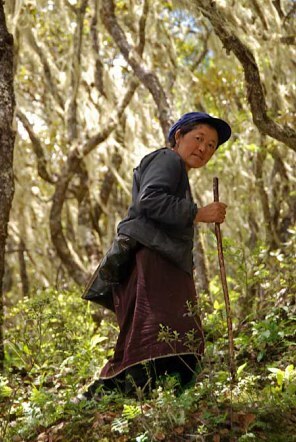 A lady carries Buddhist scriptures in a special frame on her back to walk around the fields. 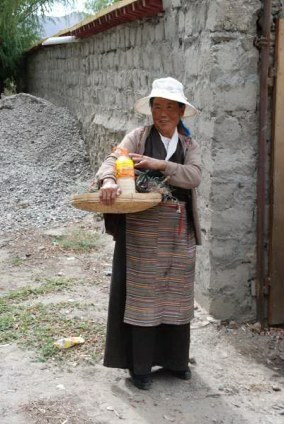 A bottle full of Chang, a tasty barley beer, is brought as an offering. 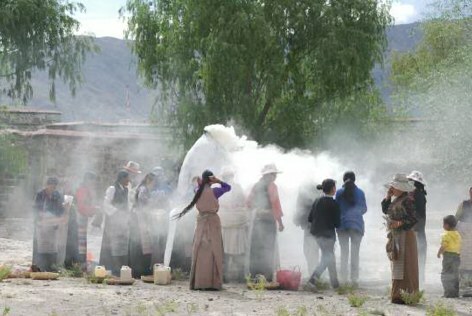 Tibetans celebrate their harvest annually with the Ongkor Festival. 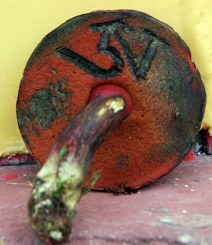 "On" means "field" in Tibetan, "Kor" refers to circumambulate. 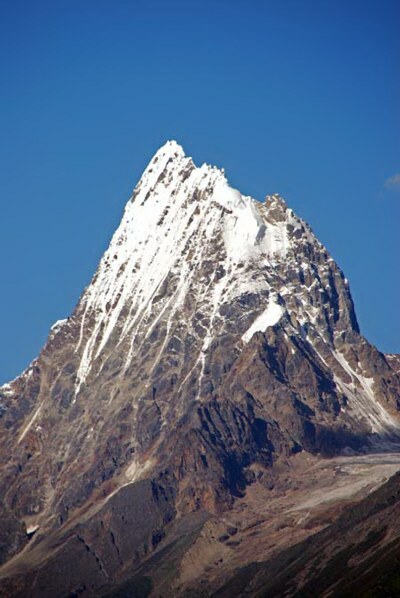 Circumambulation of sacred sites, be it a stupa or a sacred mountain is a traditional form of worship. Thus "Onkor" means "circumambulating the fields". 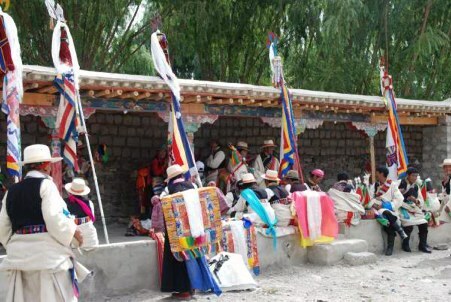 The festival is especially popular in rural Utsang, Central Tibet. In general, Onkor is celebrated about the time when barley is just about to be harvested. 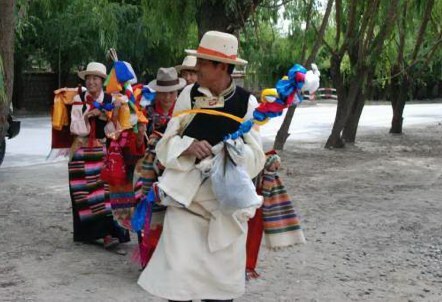 It is said that the roots of Onkor reach back to Bon practices, the endemic pre-Buddhist religion in Tibet. 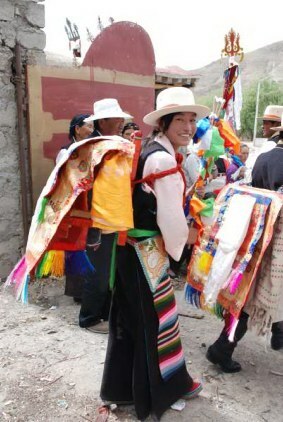 After the circumvolution all kinds of festivities like dancing, horse racing, arching etc can be enjoyed. A sang offering of aromatic plants like Juniper (Juniperus spp. 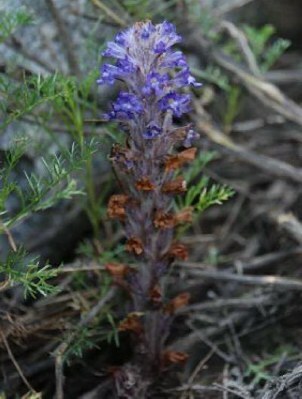 ), Mugwort / Sage brush (Artemisia spp. ) or Rhododendron is being burned. People take turns in adding splashes of chang to the fire to make offerings to Buddhas, protectors and local spirits. 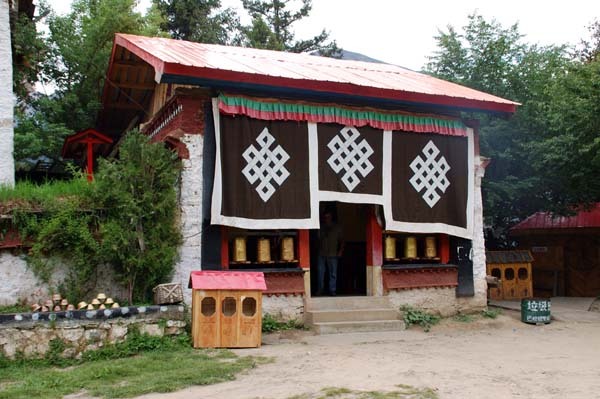 Yumbu Lhakhang is Tibet's oldest building. 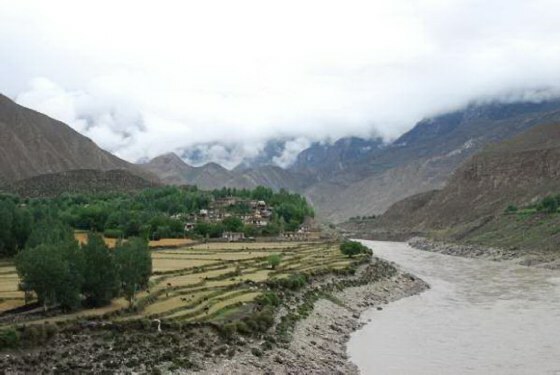 According to Bön history, Yumbulagang was erected in the second century BC by the first Tibetan king Nyatri Tsenpo. Everything but the first floor was destroyed by the Chinese during the Cultural Revolution and rebuilt in the early 1980s. Netong County, Lhoka / Shannan Prefecture. Looking West from Podrang La pass down to Chusum (Qusum) Valley out of which the highway winds it way up to nearly 5000m. Please note: A single Tibetan place name is spelled in different ways in this report due to lack of good standardization. In addition, I also report the Pinyin transliteration of the Chinese names and/or the Tibetan Pinyin name, the official, but often little known rendition of Tibetan into western language, the standard on international maps. Soon after Tsetang the paved road turns into dirt road and leaves the Tsangpo River, since the Tsangpo valley turns into a narrow gorge. 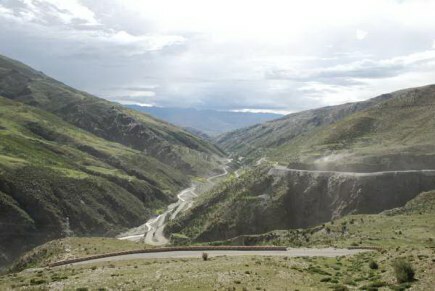 The road leads though Chusum (Qusum) County and winds its way up to Podrang La Pass (4840m / 15.875ft). From up there we had an awesome view North onto these glaciated peaks, which were told by some locals are known as Mount Zoom ( ca. 5640m / 18,500ft). And yes this is my zoom at half force. Beyond this range deep down runs the Tsangpo and then comes the next 18,000 ft range. Talk about some serious relief energy. 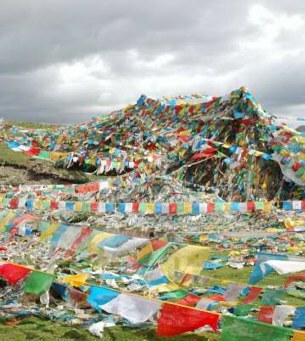 Podrang La Pass with lot's of Lung Ta, prayer flags. We were moving rather slowly up there, since we just flew in the same day and now found ourselves in very thin air. The lower slopes along the Tsangpo River are quite dry and degraded and in stark contrast to the irrigated fields that were already harvested here in mid July. 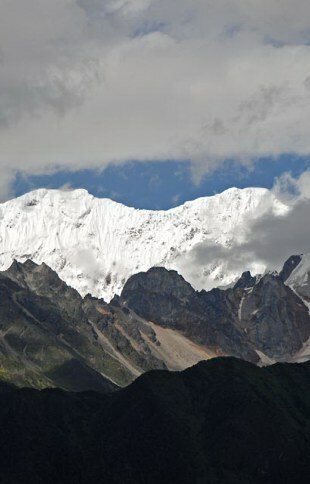 The Tsangpo will turn into the Brahmaputra upon leaving the Himalayas, but while cutting through the Himalayas in Arunachal Pradesh it is known as Dibang. 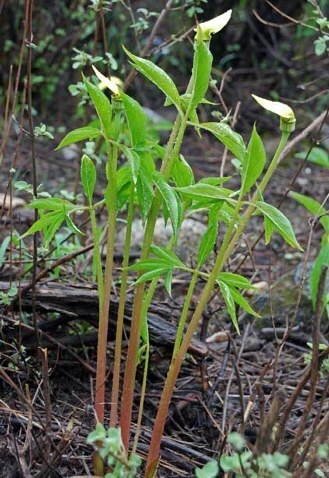 A typical plant here is the graceful yellow Cobra Lily, Arisaema flava. 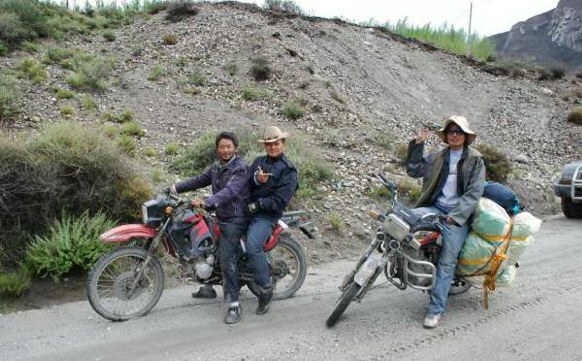 "Born to be wild" the modern Tibetan way. 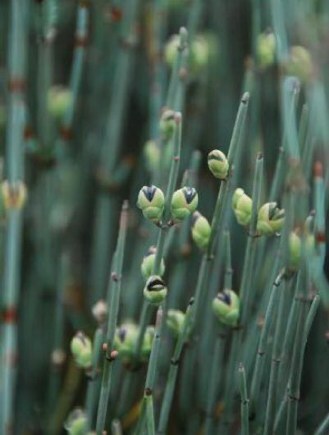 Along the road grew the medicinal Ephedra likiangensis. 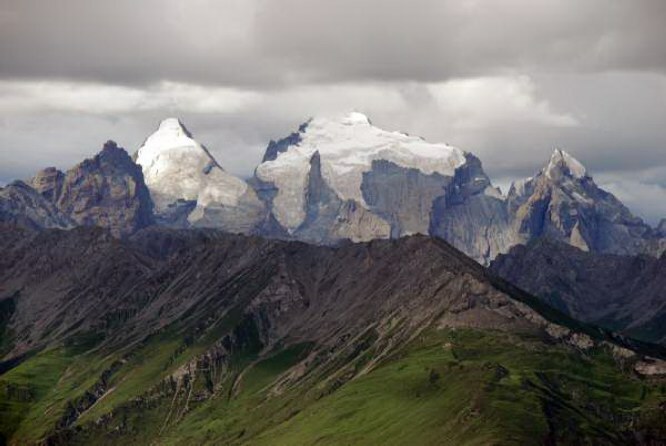 The Tsangpo Valley with the County town of Nang Dzong (Lang Xian) to the right. Note the dryness of the slopes and a few remaining Cypress trees. Here in main street Nang a local cop pulled a not too uncommon power game on us. He told us "No picture taking or you are in trouble", which is a pretty absurd statement, since we were not taking pictures of the omnipresent security forces or military installations, two clear no-nos. Luckily we had no reason to remain in Nang. 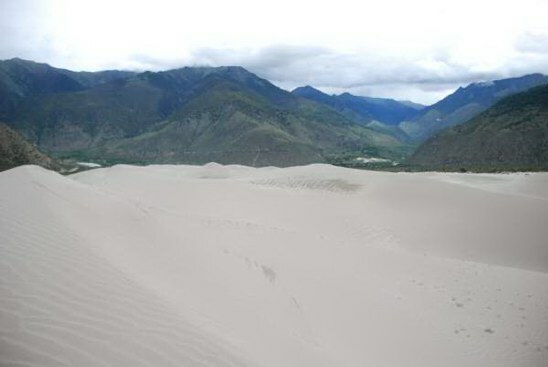 Huge sand dunes, still being sedimented by winds blowing up the Tsangpo valley, in Nang County. An Orobanche, a parasitic Evening primrose growing on the edge of the dune in Nang County. 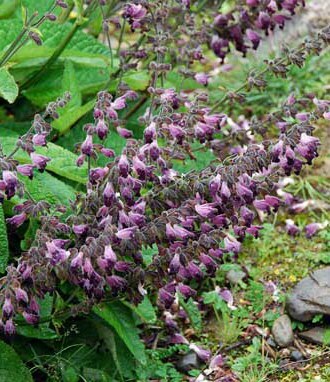 Salvia castanea is a vigorous growing sage native to Kongpo. 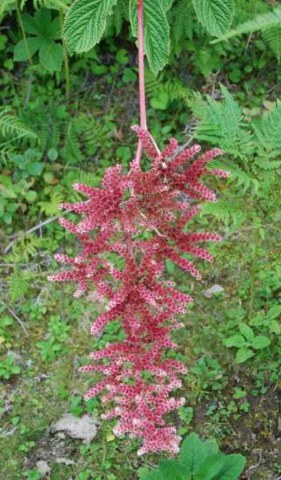 Apparently it is not very palatable to livestock, thus impressive plants are common. A creek had blocked its culvert and was running across the road. We thought this small car never going to make it, but it did! 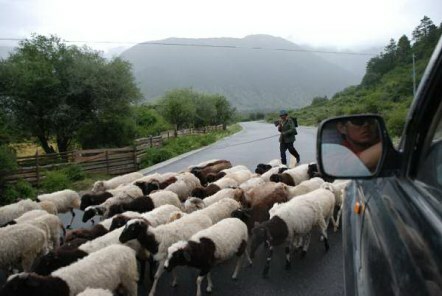 The Tibet-Sichuan Interstate Highway is a multipurpose communication artery. A short forest walk near Dungdor did not turn up anything impressive, but we knew for sure peak season was just happening! A big Russula cf foetens, whose cap fractured in a very peculiar way. This Russula we found in many locations. Nematoloma fasciculare, the Green-gilled wood lover is a truly circumpolar wood rotter. It was growing on wood underground. I tried it to see if it was bitter, and bitter it was. 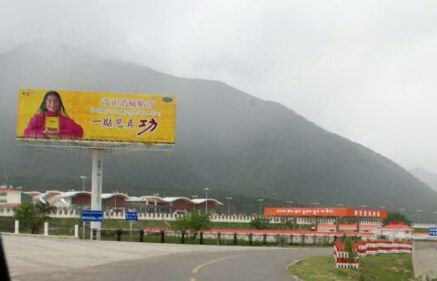 The new Nyingchi airport (2950m / 9670ft), 40 km to the Southwest of Bayi Town was opened in 2007. 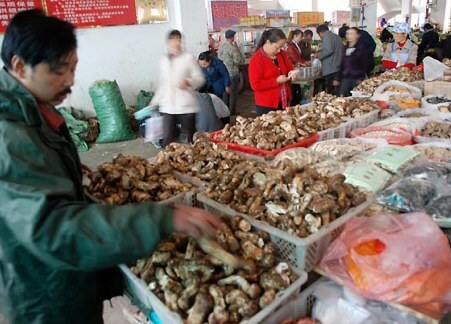 The airport is a main conduit for the export of fresh matsutake to Japan, before 2007 the mushrooms were driven to Dechen Airport. 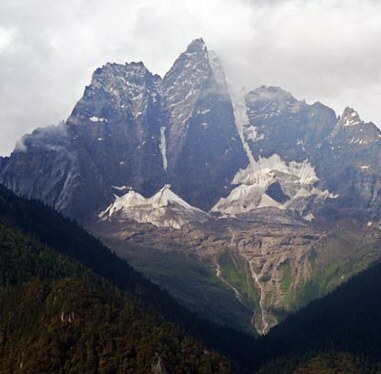 In summer there are daily flights to Chengdu, but no connection to Lhasa, which is a 8 hour drive. 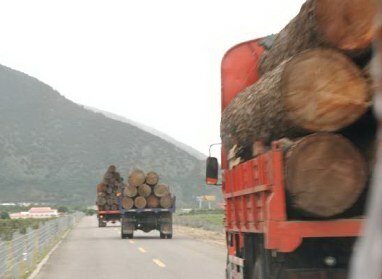 Timber transport near the airport. 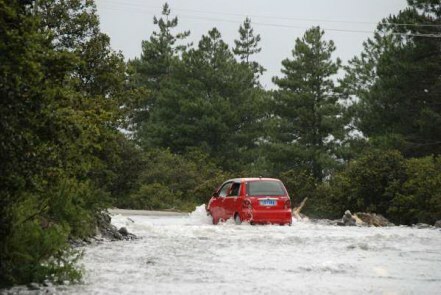 Although China enforced a total logging stop in the upper catchment of the Yangtze and Yellow rivers. However, the 1998 logging ban did not apply to the forests growing in the catchments of Mekong, Salween and Tsangpo / Brahmaputra. 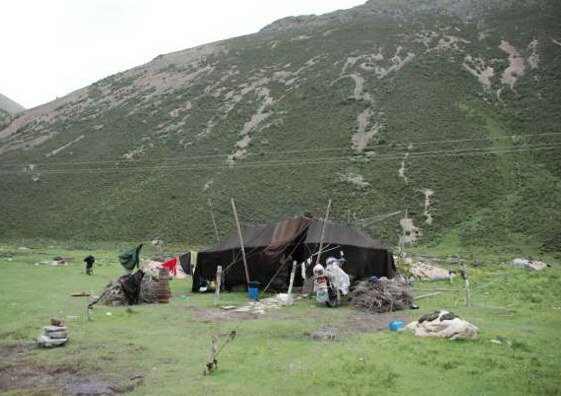 Still forestry has come along way on the Tibetan Plateau and the devastating mining of the forest resources carried out by state logging units from the 1960s to the 1990s was luckily terminated. Piles of fresh matsutake mushrooms. 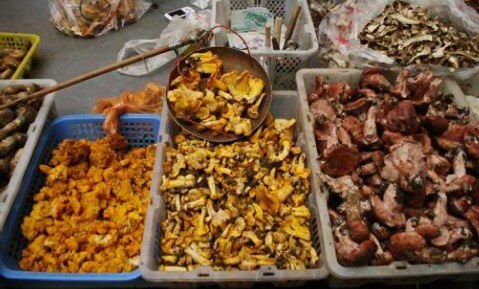 Besides omnipresent matsutake (Tricholoma matsutake) we found fresh Witch's Butter (Tremella mesenterica) and Russula Waxycap (Hygrophorus russula), known by the ever growing Chinese population in Bayi as Qinggan Jun. 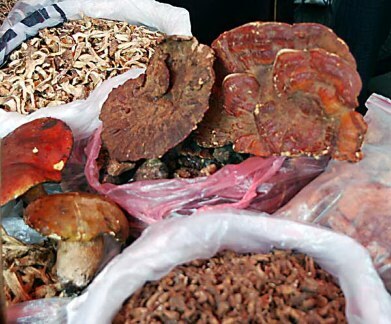 Ling Zhi (Ganoderma), king boletes and a plethora of dried fungi. We bought as half a pound of chanterelles and took them to an excellent Tibetan restaurant and ordered fried rice with chanterelles, yummy! 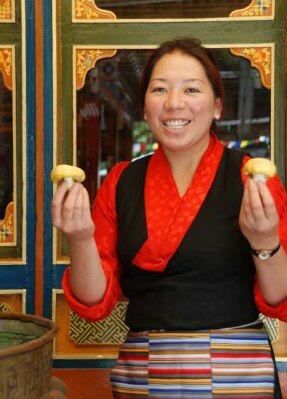 On the left Momos, one of Tibetans' favorite foods. 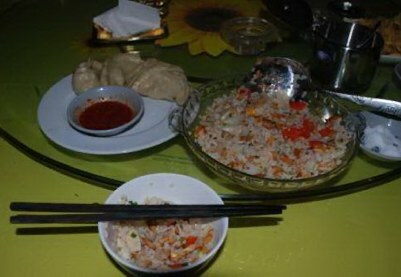 We always make a special effort to frequent Tibetan run restaurants and stay at Tibetan owned hotels in Tibet, which is not always easy. 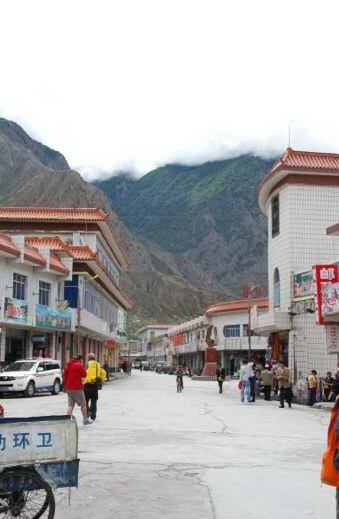 Bayi's main shopping areas with its informal Yartsa Gunbu market. 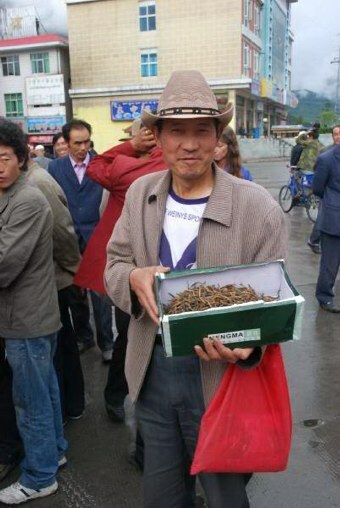 While in July there are tons of Yartsa gunbu deals taken place, I was quite surprised to still find so much freshly harvested Cordyceps sinensis on the market. 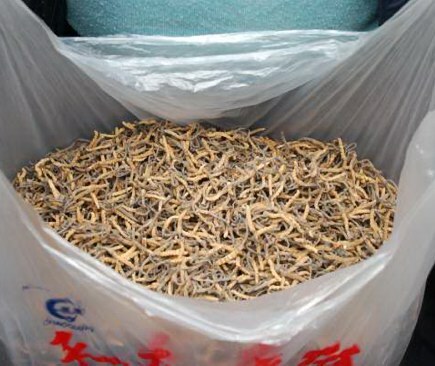 This bag contains three pounds of Cordyceps sinensis. Since these are relatively small specimens of go marpo, meaning in Tibetan "red head", as the Himalayan Yartsa gunbu is known, it is worth only somewhere from $6000 to $12,000. Anybody in need of a shoe box full of caterpillar fungus? 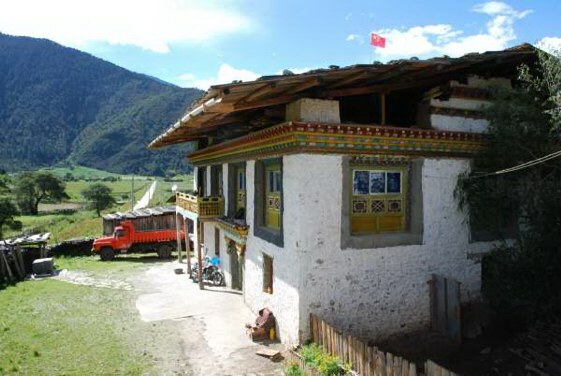 Lama Ling is a Nyingmapa Gonpa in Copper-colored Mountain / Zandok Palri style, located 30 km SW of Bayi in Buchu (Puchu / Puqu) Township, half way to the new airport in 2950m / 9670 ft altitude. 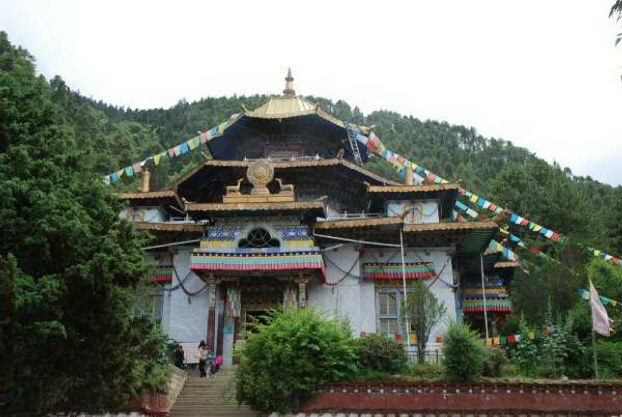 Buchu is famous for having the oldest temple in Kongpo built by King Songtsen Gampo. Dudjom Rinpoche, who rebuilt Lama Ling after it was destroyed by an earthquake in 1930, is omnipresent here. 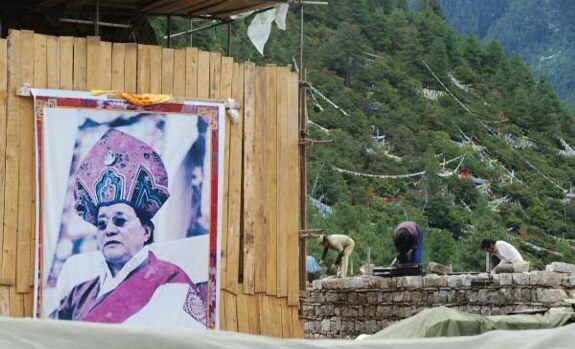 A huge photo thangka of the late Dudjom Rinpoche covers a provisional protective wall. Behind the board wall a huge statue is being build. Guru Rinpoche whose life-size statue shows him on the throne next to a Guru Rinpoche statue. Beautiful Wooly Chanterelles (Gomphus floccosus), which are according to latest DNA research not related at all to true chanterelles (Cantharellus spp. ), but evolved closely to corals (Ramaria spp.). A young Amanita, maybe close to A. franchetii and probably actual poisonous (see below). 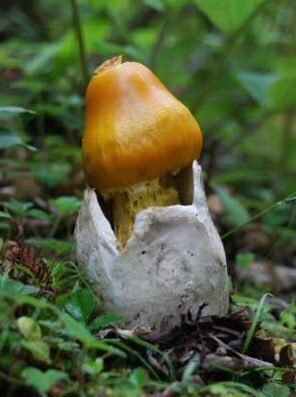 Amanita hemibapha is closely related to Europe's Caesar's mushroom (A. caesarea) and is sold on many markets in Tibet. 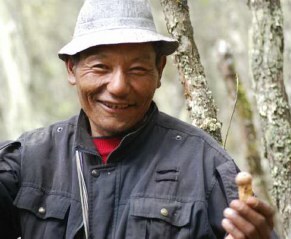 This friendly farmer who doubled as forest guard insisted that this mushroomis poisonous, so we left them with him. 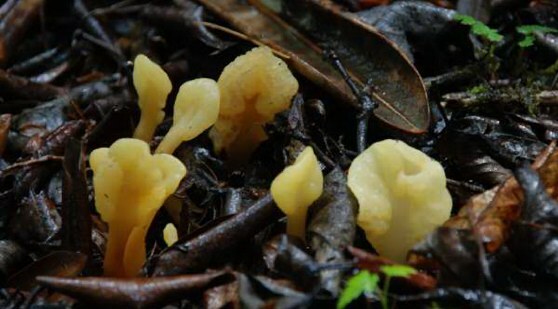 In general, the identification of the Himalayan Caesar is not too difficult; the yellow gills and a yellow, hollow stipe in addition the huge sac-like volva at the stipe base and striations on the cap edge are very clear characteristics. 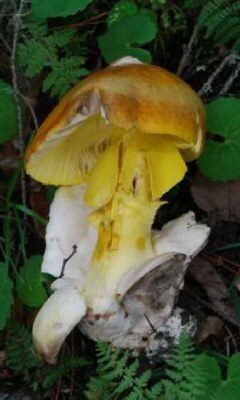 However, the genus Amanita contains also some deadly members, so we did not push our luck. Flowers of a Rodgersia pinnata. 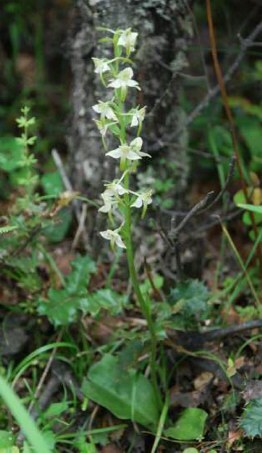 A Butterfly orchid, possibly Platanthera chlorantha. 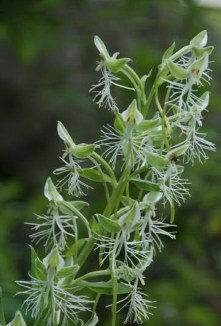 It reminded me quite a bit of the European Platanthera bifolia, that is distributed into Siberia and North China. 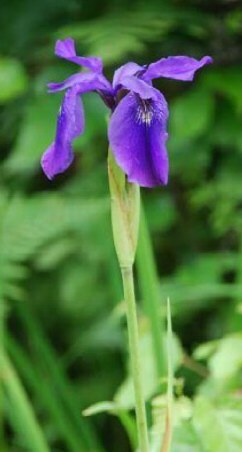 It is always a joy encountering Iris chrysographes. Luckily it is widely distributed in Kongpo. Exotic flowers can be delivered directly to your home by Avas Flowers. A flower arrangement from Avas can be a great gift for any occasion. 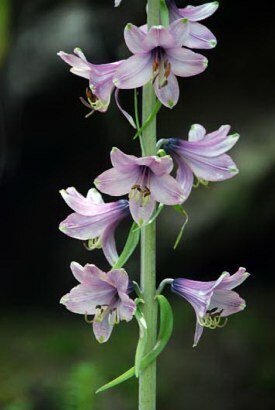 I am always excited when I come across Notholirion bulbiferum, a 4-6 ft tall, rare and beautiful member of the Lily family. 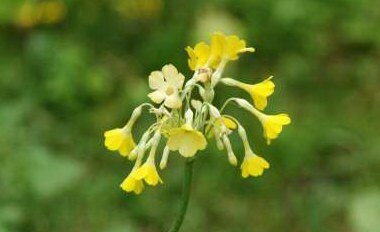 A Primula, not really sure yet if it is P. sikkimensis or P. florindae. 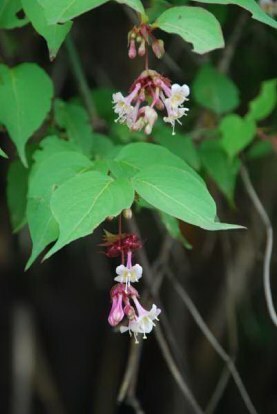 Flowers of the Himalayan honeysuckle (Leycesteria formosa). It is always great to find a favorite from my garden in the wild! 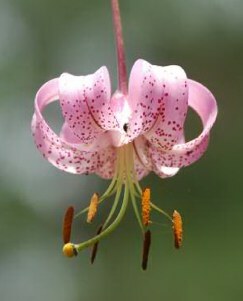 Probably Lilium pumilum just started to flower in mid July. 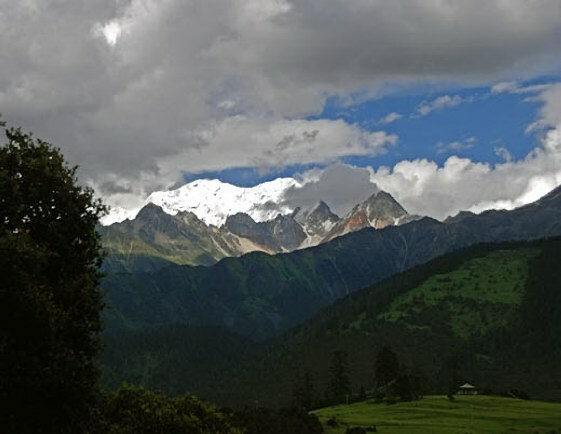 Gyala Peri (7294 m / 23,924 ft) and Namche Barwa (behind the range, invisible) are the highest mountains in the Eastern Himalayas. 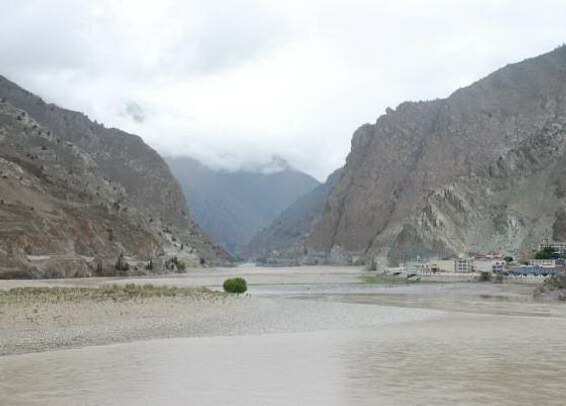 Deeply entrenched between these two mountains runs the mighty Tsangpo River. Taking the heights of these peaks into account this represents the deepest gorge on the globe. 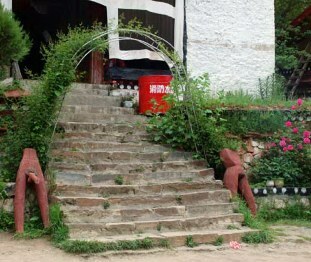 Here the farmhouse of the family of Karma in Tashigang who we stayed with and got to know a little bit. Karma took us even along to look for matsutake! They had build another house in the colorful traditional style [its balcony is shown on the left] to be able to rent out rooms to guests in the summer. Inside the kitchen of Karma's house hanging out at the stove is her 90 year old grandfather. On the left our excellent guide Jimpa. On the right Karma's mother is just entering. 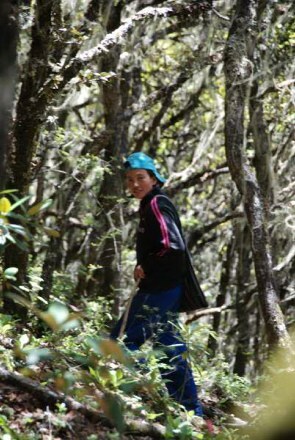 Searching the oak forest for matsutake with Karma, we met a dozen other Tibetan mushroom hunters. We only found Matsutakes that were just scratching the surface, so intensely these forests right above the village seemed patrolled. After we had spend the morning picking matsutake with Karma we split off and searched the woods for flowers and fungi ourselves. 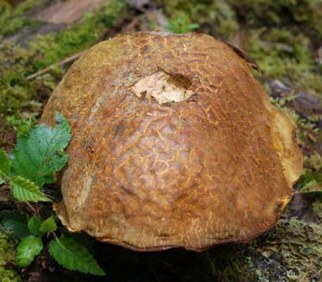 Besides matsutake and orchids, we were most excited to find beautiful king boletes in prime condition. 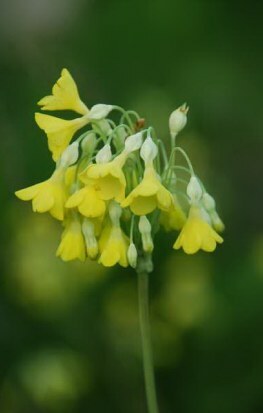 And they really looked just like kings, displaying all the major characteristics, a smooth brownish cap, white pores when young and turning yellowish-green with age, stems with a wider base and perfect reticulation on the upper half. Also they smelled and tasted totally their king bolete part. They had that rich nutty taste I cherish it for and I had a hard time stopping myself tasting it, since eating raw bolete was a habit I had developed as a kid whenever I found a nice firm Steinpilz. 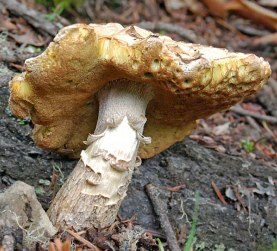 So maybe it was not Boletus edulis, but at least a Boletusvery closely related in the edulis group. And we kept finding more and more "royal" boletes, especially along the edges of the oak forest, what a delight! We took them back to the farmhouse and proudly presented them to Karma. Karma looked at them and told us with wide open eyes, these mushrooms are poisonous! I was completely incredulous and showed Karma the pictures in our mushroom books that were a total match. 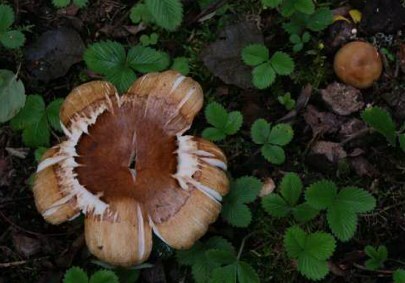 Then her grandfather chimed in, in my 94 years no one ever ate these mushrooms here, they are poisonous! 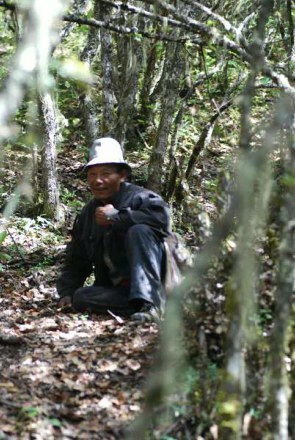 Then I recalled, the year before in Nyarong, East Tibet, I encountered the same attitude towards "royal" boletes, listed in a good Yunnan mushroom book as Boletus edulis sensu lato. A Nyarongpa told us it was "poisonous". I was perplexed by the local lack of knowledge about this tasty and easily recognizeable mushroom. 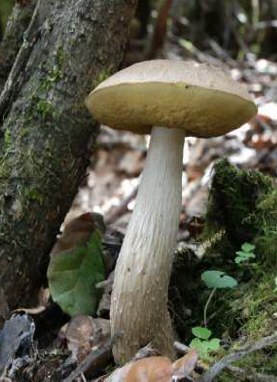 So I took a specimen of this supposedly poisonous mushroom with me (see below) to the next market town and compared it to the king boletes in trade. It turned out that the same species was traded commercially! 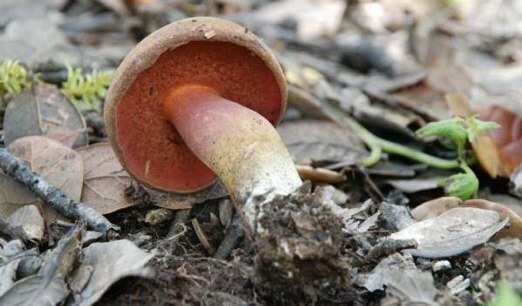 Some of these boletes might even end up on the global market sold as "Italian Porcini", since many Italian porcini are now imported from China, especially Yunnan, which includes Tibetan areas and imports lots of mushrooms from other Tibetan areas. Furthermore, I have been eating Tibetan king boletes many times before in restaurants in Tibet and never had any ill effects. Now what should we do with our beautiful boletes? Throw them out just like the Himalayan Caesar mushrooms (Amanita hemibapha), we had dumped in a similar situation a few days earlier? 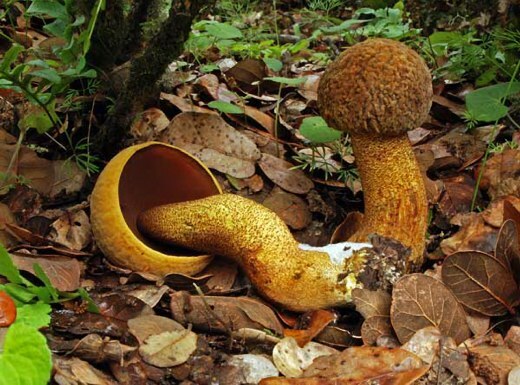 However, boletes are truly no amanitas. With Amanitas the stakes are extremely high, since there are several deadly ones. So there is really no point in eating Amanitas without being at least 100% sure! And even then many people rightly just abstain. 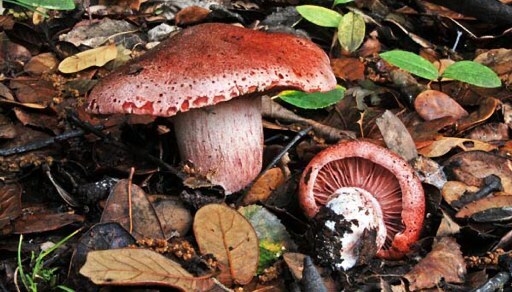 On the other hand most members of the genus Boletus are edible, besides some beautiful red-pored or very bitter boletes, which can cause pretty unpleasant digestive problems, but not a fatal liver or kidney failure in healthy people. Anyway, our boletes were clearly edible king boletes, but there was no point in arrogantly ignoring the well-meaning advice of our kind hosts and cook some "poisonous" mushrooms in their kitchen and then delightfully indulge. 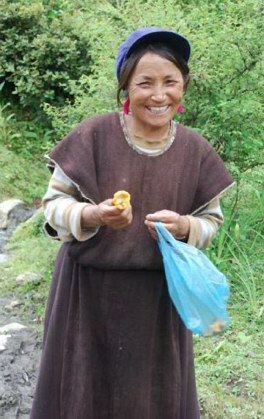 So I told Karma, I have been eating king boletes all my life, including in Tibet. And these mushrooms look just exactly the same, but we will heed their warning, who knows maybe your local variety has a strange component. We will cook up this batch and eat only a tiny bite for dinner and then wait and see what happens. That eating a tiny bite was not so easy, they were just so delicious. However, since we were in the family kitchen that doubled as living room, we stuck to our promise and Karma and her grandfather seemed relieved. Needless to say that the night was uneventful and what woke us up in the wee hours was the call of a confused rooster and not a wicked call of nature. When we enjoyed some more king boletes in the morning rolled in freshly baked tortilla-like bread, Karma and grandpa were still not interested in joining in in the delight. Hopefully next year Karma will join us discovering the deliciousness of these awesome mushrooms. 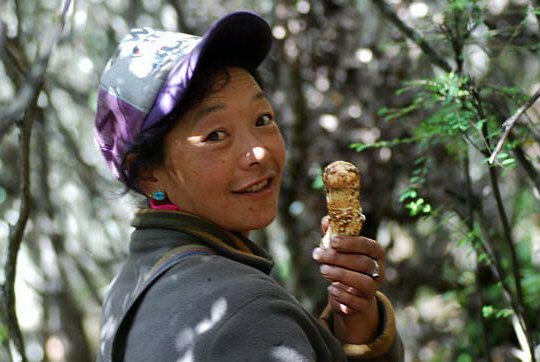 And Karma and her family could pick plenty of king boletes without facing the intense competition as collecting matsutake in the oak forests around Tashigang. 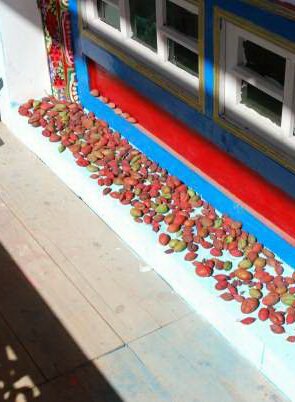 Fruits of the medicinal Himalayan May apple (Podophyllum hexandrum) are drying in the window of the farm house. A tall Boletus reticulatus growing next to an oak trunk. Here our bounty of Boletus reticulatus (and few other dark boletes, we did not fry up. We sliced up a load of king boletes (B. reticulatus) we had found. However, when we wanted to cook this king bolete we met resistance (see on the left). While Karma sold all the matsutake she collected, we cooked ours with rice to transfer their fragrance. Otherwise Karma fried up lots of Hygrophorus russula and green onions in butter, Shimpu-re!, very tasty. 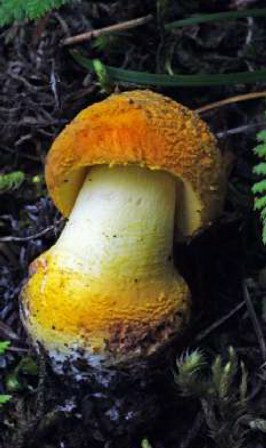 Boletus edulis sensu lato (Wang et al. 2004, p.31) I found in Nyarong in July 2009. 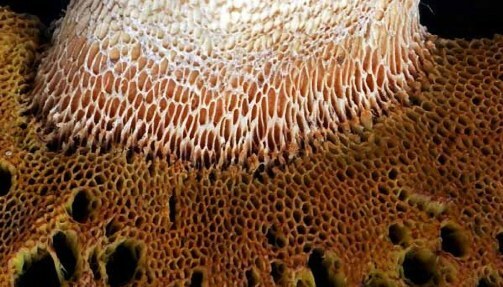 Note how the pore structure turns into the reticulation of the upper stipe. 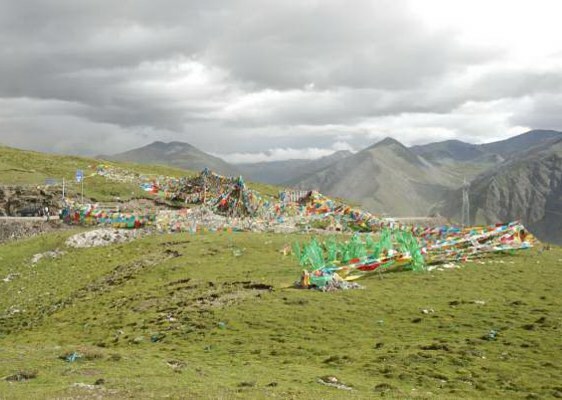 Photo: D.Winkler, near Tsokar Ayali Gompa Nyarong / Xinlong County, Ganzi Tib. Aut. 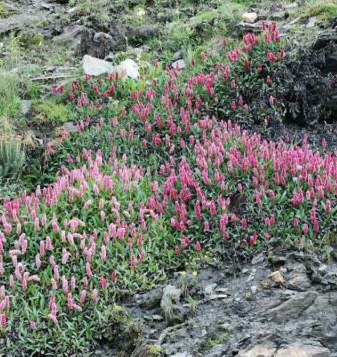 Pref., Sichuan, 3800m. 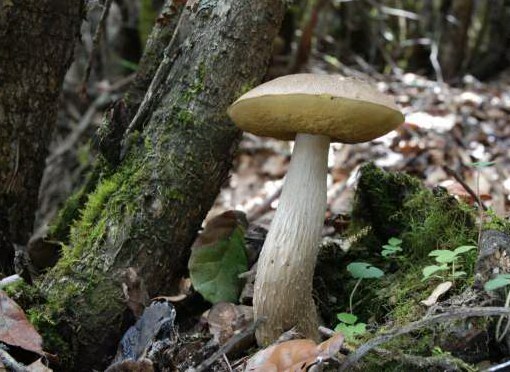 A king-like bolete we were told by a young Tibetan man that it is supposedly poisonous. 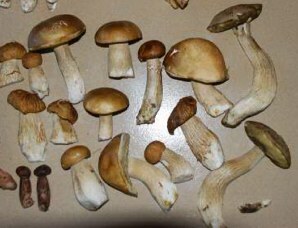 However, the same bolete is sold on the markets in East Tibet with other king boletes and I have eaten it without any problems. 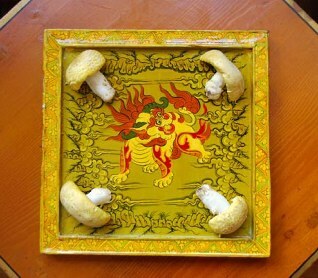 The most common name for matsutake (Tricholoma matsutake) in Tibet is Beshing Shamo, or short Be Sha, meaning "Oak mushroom", since in Tibet matsutake grows associated with evergreen oaks. 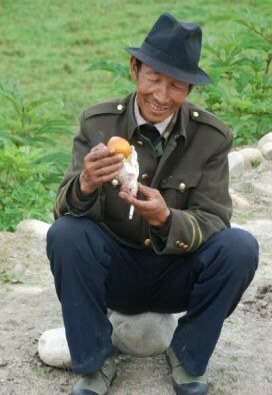 But here in Kongpo the locals called matsutake Raba. I was surprised how many people were looking for matsutake in the woods. We encountered nearly a dozen in a few hours, crazy! I guess the location close by a big village explains such intense collection. Also, most matsutake are not collected as local food source, but as export product going to Japan. 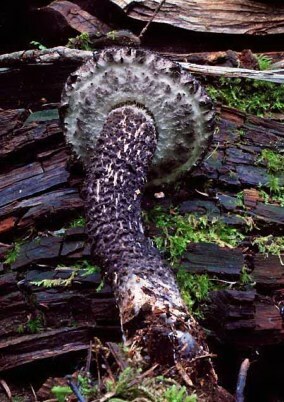 Matsutake is the best cash source in summer, only outdone by caterpillar fungus collection in spring. Karma with the first matsutake of the day. 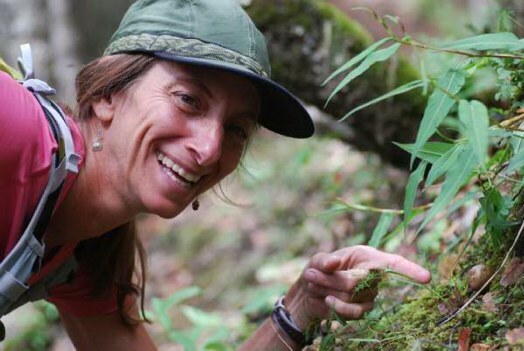 Deb pointing to a round brown stub, the cap of a young matsutake. 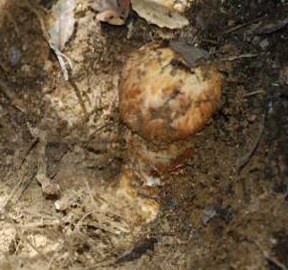 These matsutake buds are pretty deep in the ground. Hunting these babies is not great for sustainability. Everybody looks happy finding a mushroom. Rene is getting friendly with Karma's horse. He went on a lengthy ride for the day, while we went in the woods exploring. The sacred Gyachin Namlha Karpo (6316 m / 20722 ft, Chin: Jieqin Nala Gabu), one of the major peaks around Draksum Tso, which means Three Peak Lake. 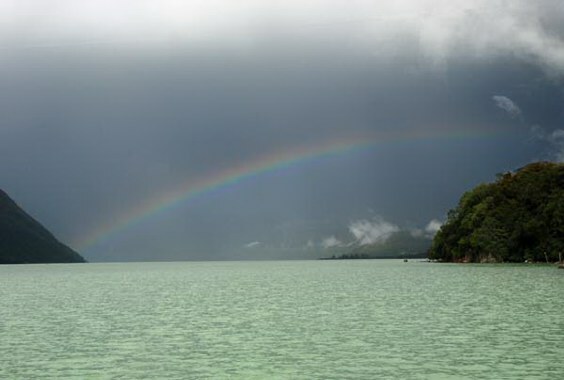 A perfect day in summer during the summer monsoon season. Sometimes one get very lucky! Aug. 8, 2011. 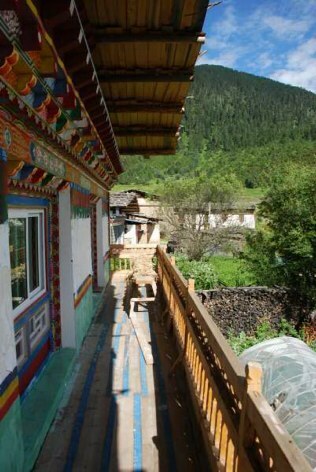 Some buildings of the small island Nyingmapa gompa. 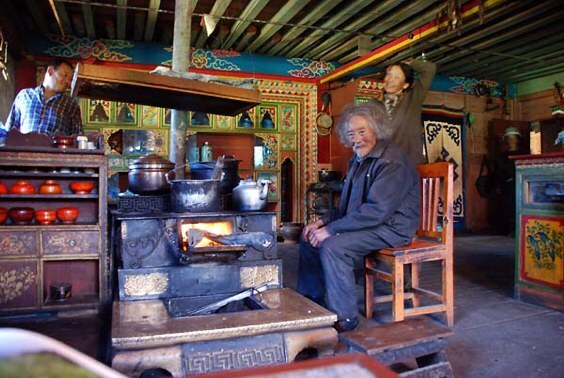 The Yak-wool hangings are decorated with the Eternal knot, one of the Eight Auspicious Symbols. Tsodzong means "rock fortress"
Pre-Buddhist fertility worship at the stairs up to the small Tsosum Gonpa on Draksum Tso's island. 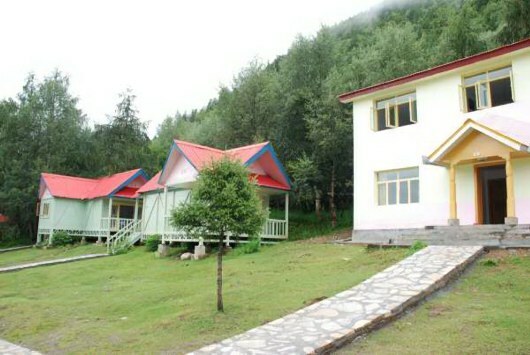 On the left the hotel facilities we were using at Draksum Tso. 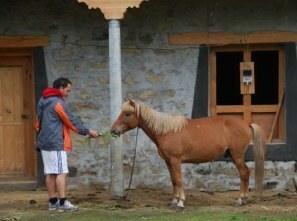 We were not the only guests to enjoy the facilities to replenish our energies. 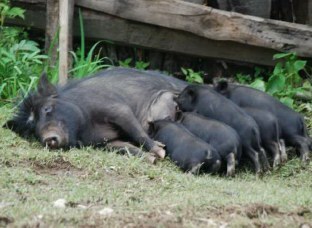 We shared the grounds with this young big family. 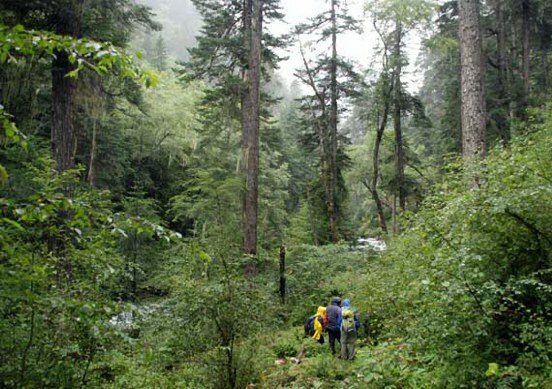 We followed a path along a mountain stream into the fir-spruce old-growth forest. In the lower parts locals had felled big trees and cut shingles and boards right on the spot. 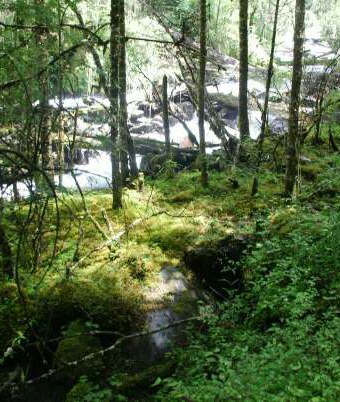 Further up the canopy closed and the ground was a bed of moss dotted with all kinds of mushrooms. Rain showers and stretches of sunshine interchanged. A Sulfur shelf or Chicken of the woods growing on a huge conifer trunk. 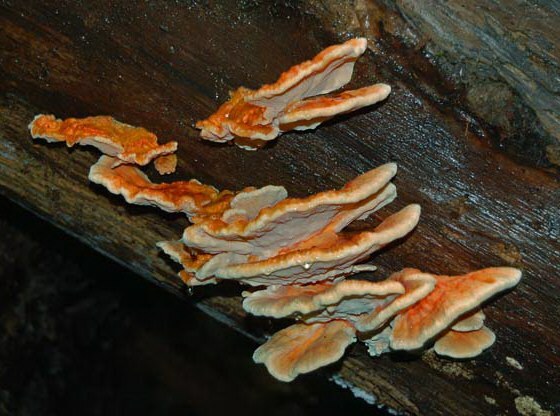 Laetiporus sulpherus var. 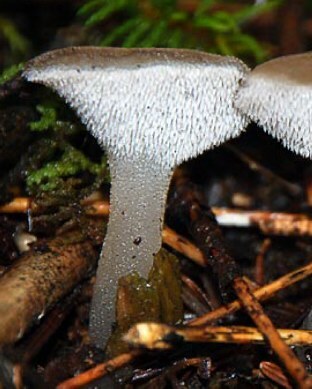 miniatus is described for Japan and has a redder cap surface. 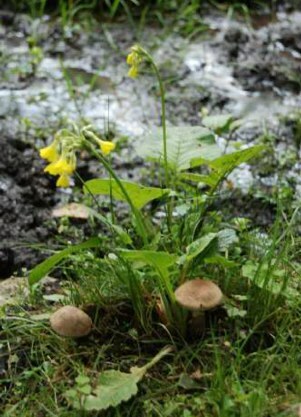 Is it also edible, but no one we asked was familiar with its edibility. 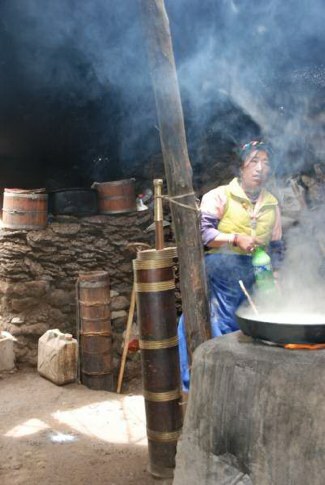 It made an awesome lunch being cooked by the kitchen in our Lhasa hotel. 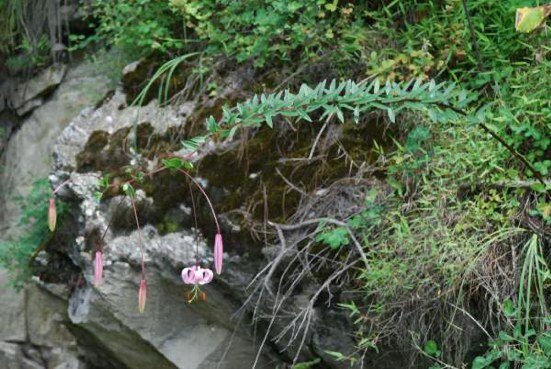 I found this unique fabeliform Stereopsis humphreyi always under spruce in several locations on the Tibetan Plateau. 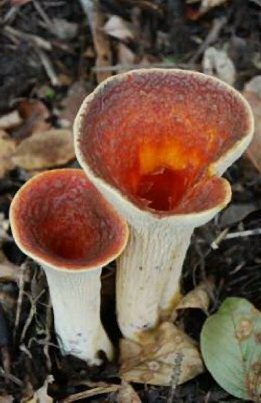 It seems very common, whereas in North America this basidiomycete is very rare and limited to the western most coastal zone. Young Spathularia earth tongues, above and an older one on the left. 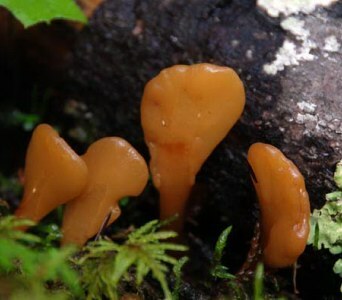 These fungi might be a bit too orange for Spathularia flavida as shown below. 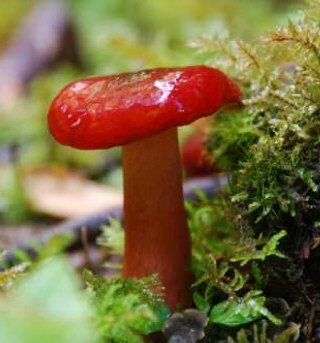 What an intense red this hot Russula sports! This one definitely caught our eye. Guepinia helvelloides is one of the jewels or rather jellies we found in the woods. 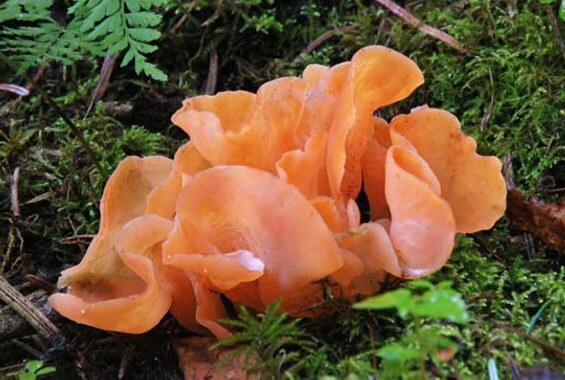 I had never seen it before, but " Apricot Jelly" is circumpolarly distributed and has a bunch of names such as Guepinia rufa, Phlogiotes helvelloides and Tremiscus helvelloides . 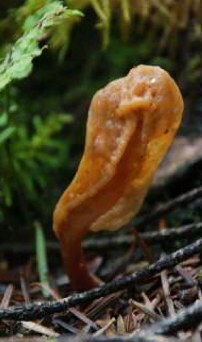 Pseudohydnum gelatinosum, the Toothed jelly fungus or Cat tongue fungus is very common in the Northern hemisphere conifer forests. A bolete as red as they get! 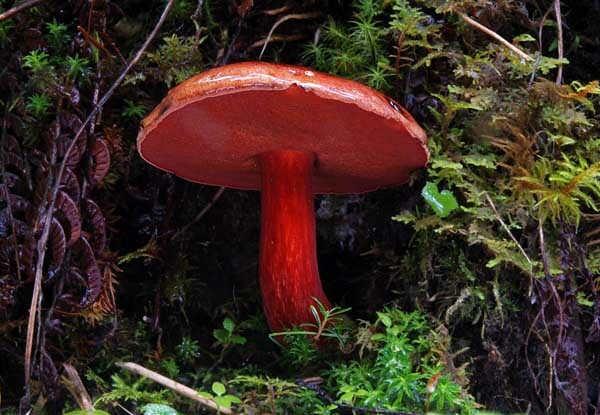 This bright red bolete is growing in a spruce-fir forest. 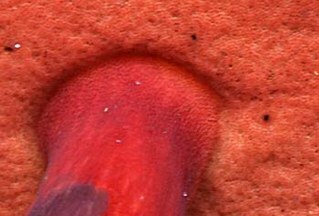 The topmost part of the stipe had a faint reticulation (see photo on the right). It was not bitter and stained immediately blue (upper right). On the American East Coast I would think this should beBoletus flammans. 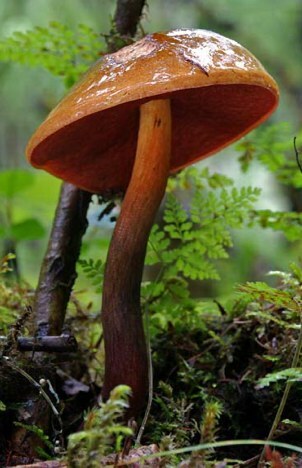 Mao (2000) also list B. flammans for southwest China, but there is a range of similar looking boletes out there as well. The specimen got a bit abused in my backpack so I wrote a Tibetan A on the pores. 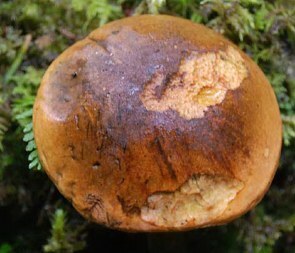 This bolete was bitter, stained blue and had a dry cap, at least it would have been dry if it was not raining that day. 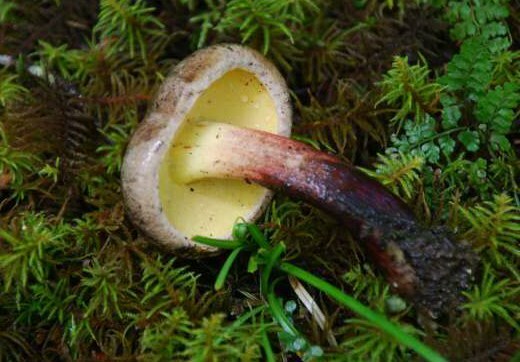 The stipe color from a red-brown base to yellow and the reticulation in the upper part together with the rolled in cap edge and the yellow young pores support the idea that this could be Boletus calopus, which is distributed all around the Northern hemisphere. 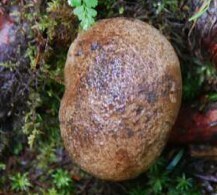 However, I am not used to B. calopus having such a slender stipe, but Yama-Kei Field Books has a depiction of a rather slender Boletus calopus. 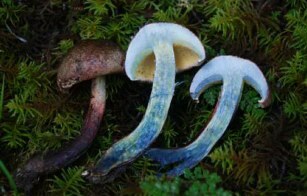 The bitter flesh stained quickly blue, especially in the base of the stipe. 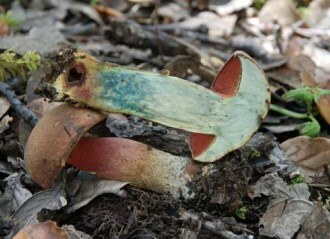 This quickly staining bolete has fine scales on the stem and no reticulation. 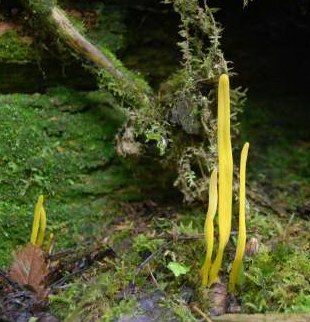 The longish, slim, curved stem is also conspicuous. Its flesh is not bitter tasting. This boletes resembles somewhat Boletus velutipes, but who really knows? A beautiful red pored bolete we found after the matsutake hunt. 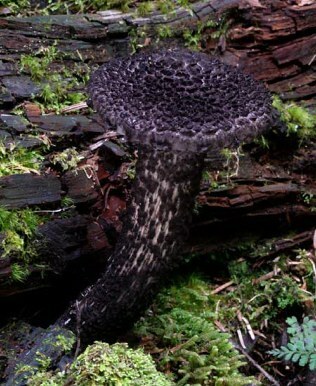 An "Old man of the woods" - Strobilomyces sp.. 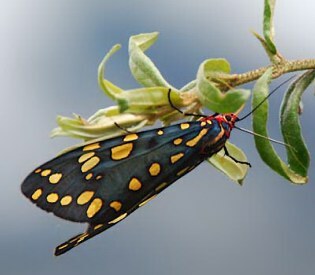 There is quite a variety of species in East Asia, but that's the first one I saw in Tibet. Draksum Tso, August 2012. Same bolete sliced showing blue staining from oxidation of exposed cell tissue. In Central Europe I would call this bolete Boletus erythropus being red pored and having a dry, velvety darkish brown cap. But we do not know enough about the funga in Tibet to be sure. 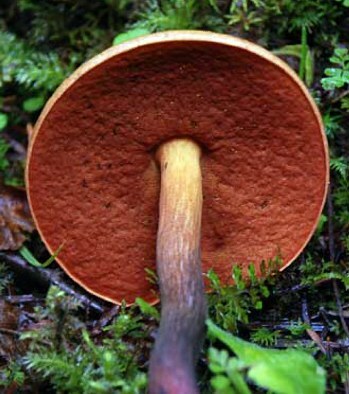 Leccinum extremiorientale, the gorgeous Far-eastern Scaberstalk. 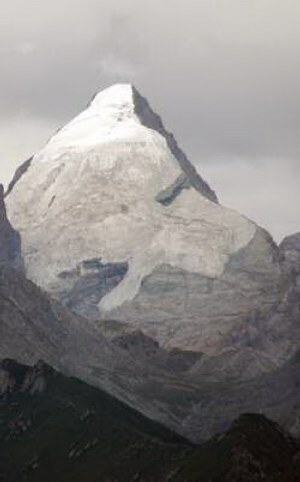 The old one was encountered at Draksum Tso and the young ones near Lunang in August 2012. 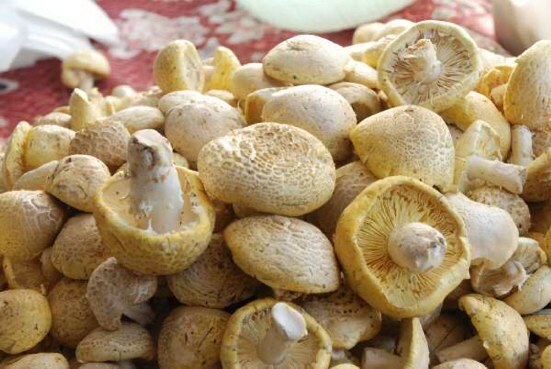 This mushroom is traded in Yunnan and Sichuan. 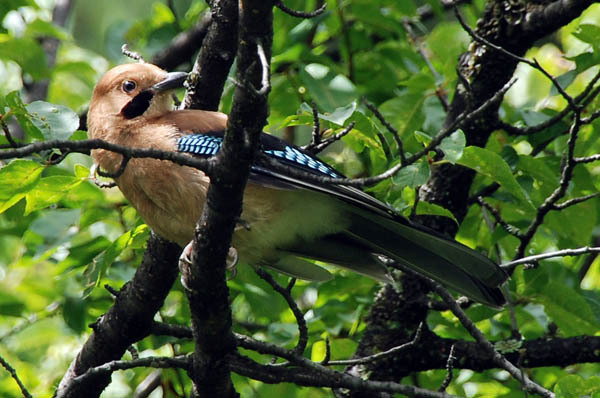 An Eurasian Jay (Garrulus glandarius bispecularis group) curiously watches us. I wished I had gotten a shot of the noisy, but very shy flock of parakeets (Psittacula alexandri or Ps. 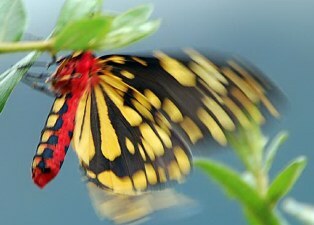 derbiana) that was flying above the woods at the same time. I was quite surprised to see parakeets thriving in 3500m altitude. 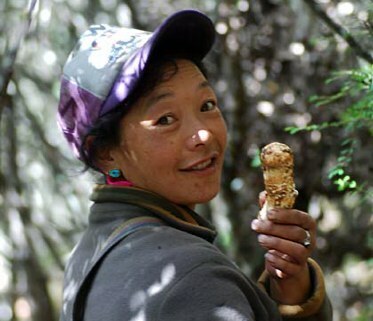 A Tibetan mushroom collector with Aspen boletes, something close to Leccinum versipelle. This summer I came across this beautiful Tiger Moth - Callimorpha principalis or Callindra principalis (Erebidae, Arctiinae, Arctiini). 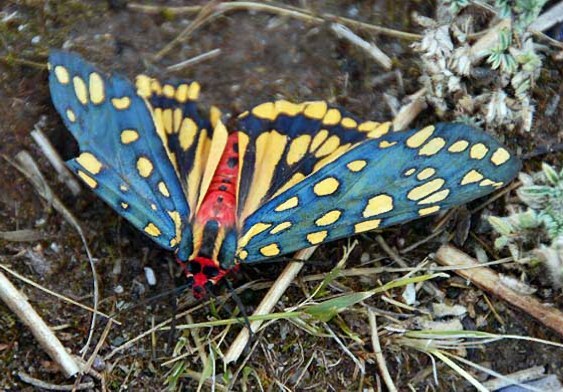 The image above was taken near Anga (3700 m, 12,100 ft),NW of Tolung Dechen in 3800m, the pictures to the left at Draksum Tso in 3450 m.
This hot-red bodied Tiger moth with yellow spotted-metallic blue wings is distributed in the Himalayas, Central Asia and NE-China. Thanks to Dr. Roger Kendrick of Kadoorie Farm & Botanical Garden, Hong Kong, for identifying it. Roger reported as source: Y. Kishida 1994. Moths of Nepal 3, 66 , plate 79:4. 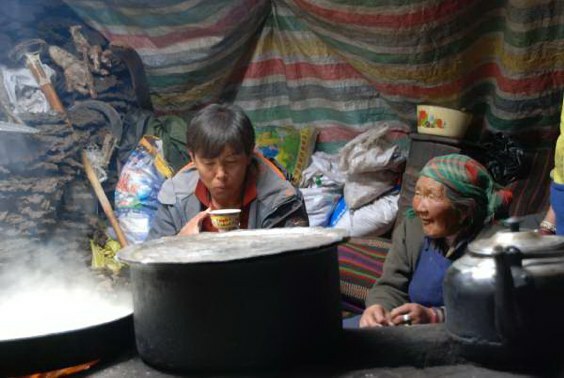 A traditional black yak wool tent pitched as summer residence in 4300 m.
Jigme, our Tibetan driver is treated to cup of butter tea. 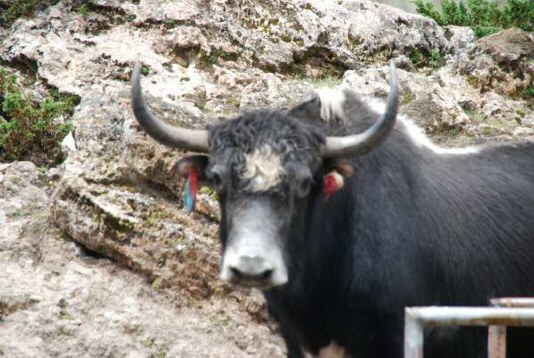 We disturbed this yak bull licking minerals at Rutok Hot Springs. The tassels in his ears indicate that he has been sacrificed. Animal sacrifice in Tibet means, an animal is freed from arduous work, will never be slaughtered and can live out his life in peace. Hot tub with fresh geothermal water. Great soak! 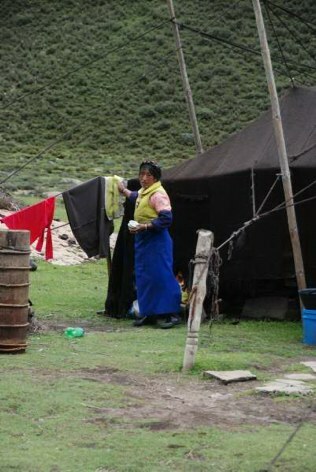 A nomad lady hanging clothing to dry. The yak cheese is boiling to separate the whey from the cheese. 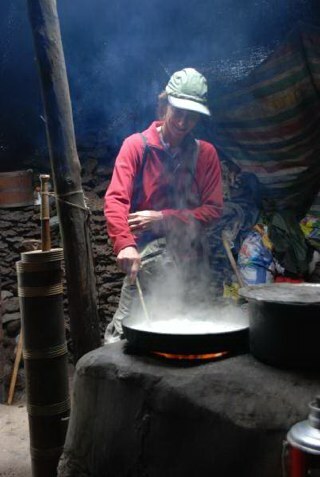 Deb stirring the freshly made yak milk cheese. 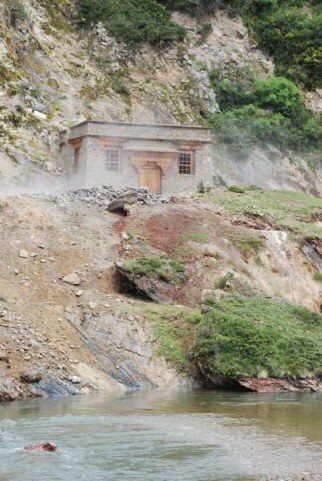 Traditional bath house at Rutok Hot Spring. 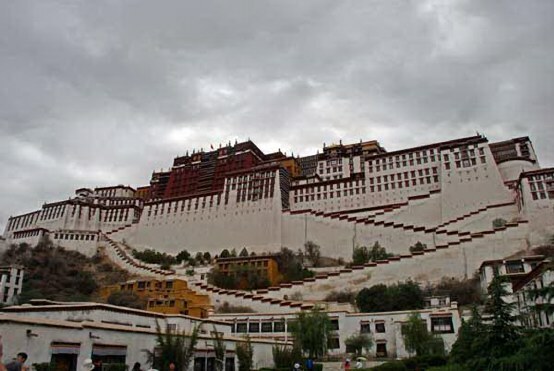 The Potala Palace, built by the great 5th Dalai Lama in the late 17th Century. Back then it was the biggest building on earth. 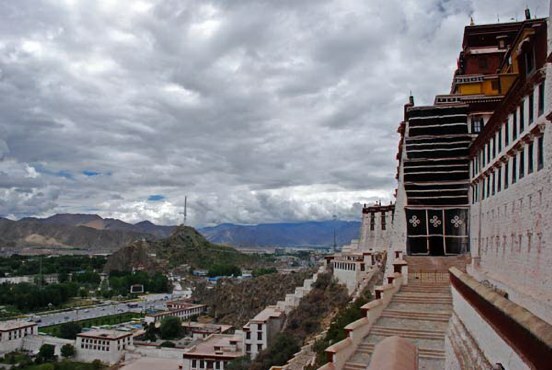 View from the Potala to Chakpori, the hill adjacent to the Potala palace. 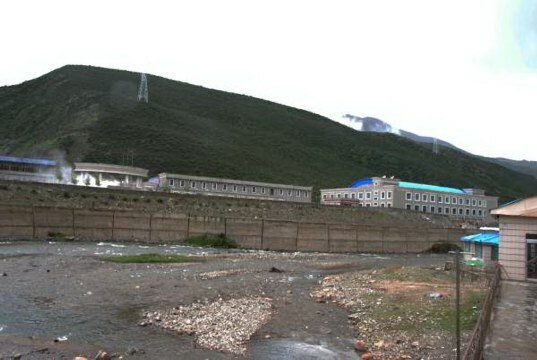 It used to be crowned by Tibet's Medical college, but the Chinese blew up the building as part of the so called "peaceful" liberation. 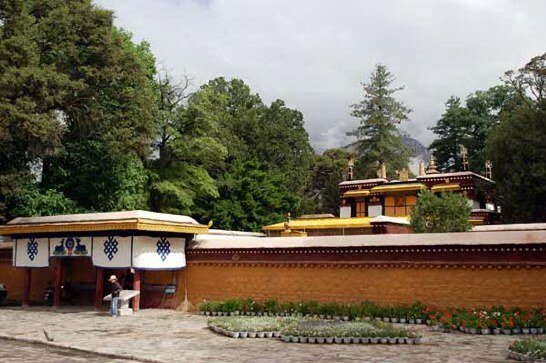 The residence of a previous Dalai Lama in the Norbu Lingka, the park with the Dalai Lama's summer residences. 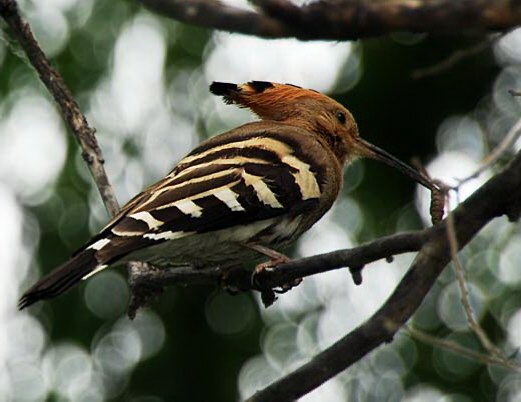 A Hoopoe (Upupa epops), a striking bird encountered frequently in Tibet during the tour. 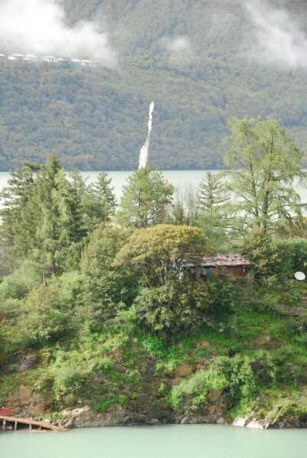 This one sits in a tree in Norbu Lingka, the summer Palace of the Dalai Lamas. 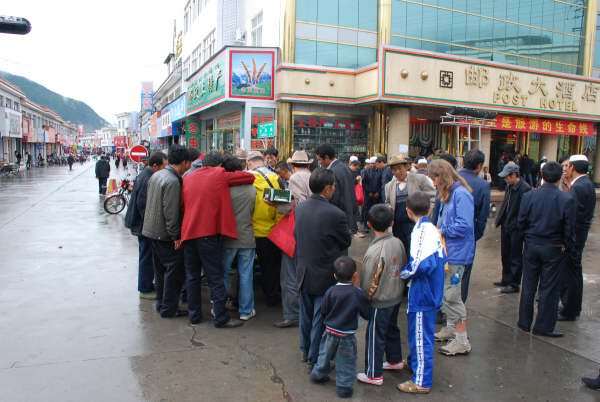 Daily hundreds of pounds of caterpillar fungus change hands in summer in Lhasa. 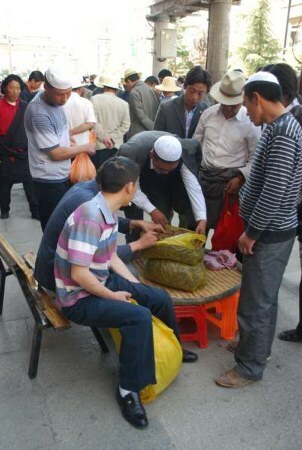 The market is controlled by immigrant Hui, Chinese Muslims usually from Gansu and Ningxia. In Lhasa in a well stocked supermarket you can buy a Cordyceps drink. It is pretty watery and sweet, but has a bit of a fungal taste, but no one would drink this for its taste I suppose, but as remedy for about anything and for tourists to adjust better to the altitude. 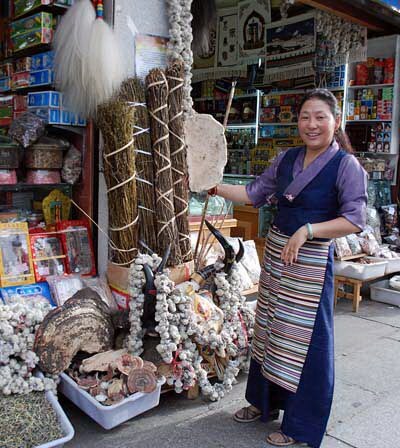 Lhasa herb store owner Tashi Wangmo showing an artist conk. Ling Zhi (Ganoderma lucidum) is for sale in many Lhasa stores for Chinese tourists, but not part of Tibetan medicine's materia medica. 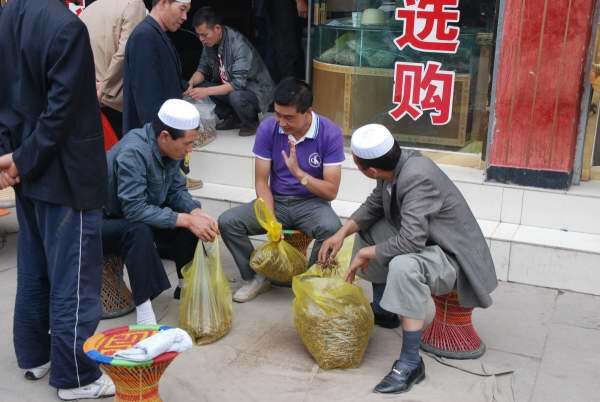 Ser Sha, the "Golden mushroom" (Floccularia luteovirens) on the market in Lhasa. It was double as expensive as matsutake, whose price is controlled by Japanese exporters! A Thangka depicting the Mandala of the Medicine Buddha surrounded by medicinal plants. 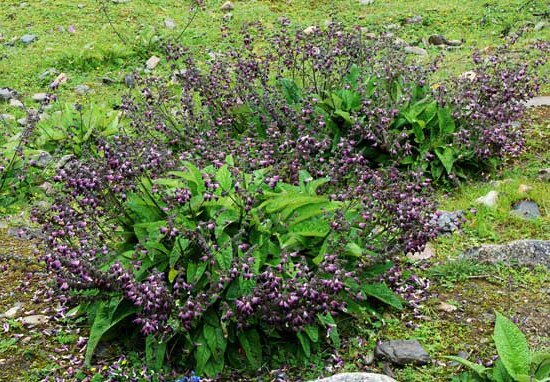 Tibetan medicine is one of the great ancient Asian healing systems. 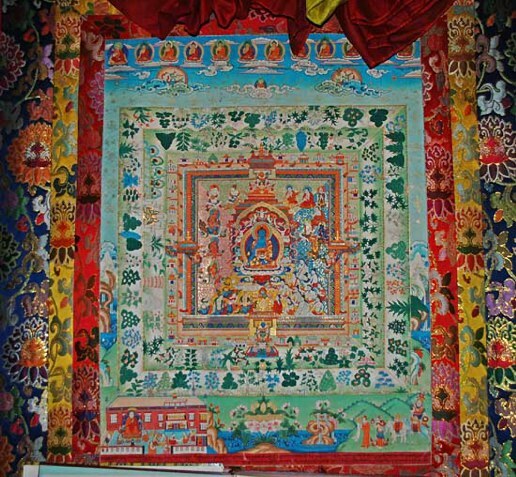 This Thangka is part of the Blue Beryl, a set of medicine teaching thangkas designed in the 17th Century by Desi Sanggye Gyatso, the chief minister of the Great 5th Dalai Lama. 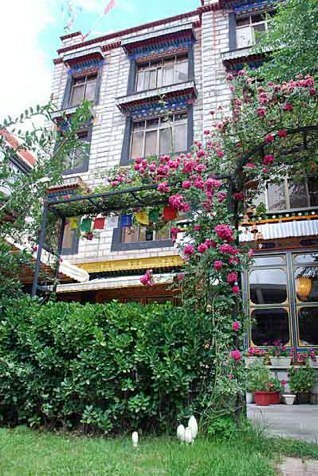 The entry to the garden of Kyichu Hotel, a Tibetan owned Hotel in the old part of Lhasa, we always use as our home in Lhasa. Note the shaggy manes (Coprinus comatus) growing under the hedge. 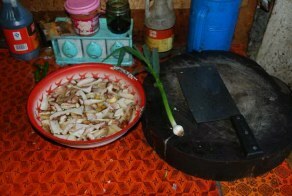 Drolma showing two Sersha(Floccularia luteovirens, see below), Lhasa's favorite mushroom before they got cooked. 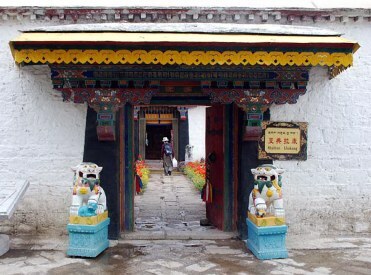 The gate of Shabtan Lhakang in the Norbu Lingka. 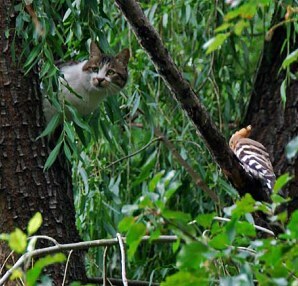 A kitty high up in a willow caught by a hoopoe as she tries to empty the hoopoe's nest. 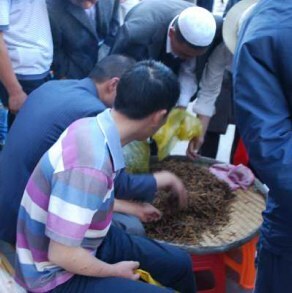 The bags of Ophiocordyceps sinensis are emptied on a table and checked carefully for quality, mainly size and firmness of larva, but also color, traces of mold and how many of the larvae are broken. 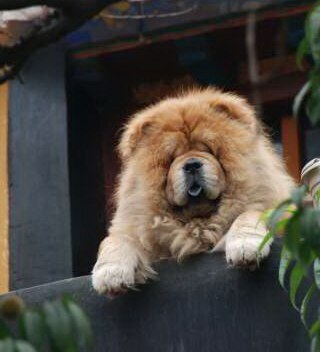 A chow chow looking over the balcony at the Ani Sangkhung Nunnery in Lhasa. 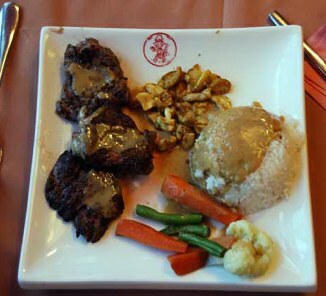 Fried Sersha and yak steak. Often we bring our mushrooms to restaurant and they will cook them for us. 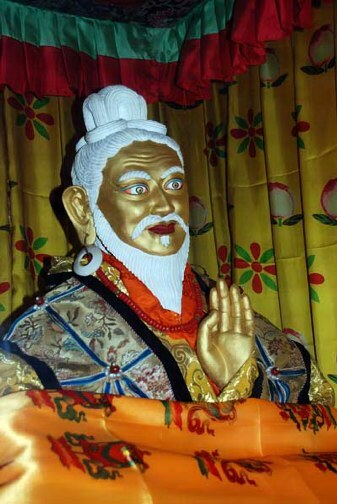 A statue of Yutog Yonten Gongpo, one of the founders of Tibetan medicine who live din the 8th Century. 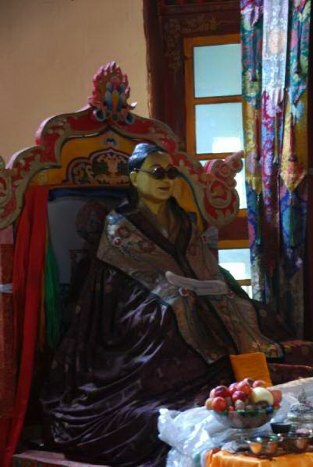 This statue is in the Tibetan Medicine clinic in Lhasa. Gyurme Dorje 2004. Tibet - Footprint Handbooks / Passport Books 3rd ed. Best Guide book on Tibet! Wang Xianghua, Liu Peigui, Yu Fuqiang 2004. 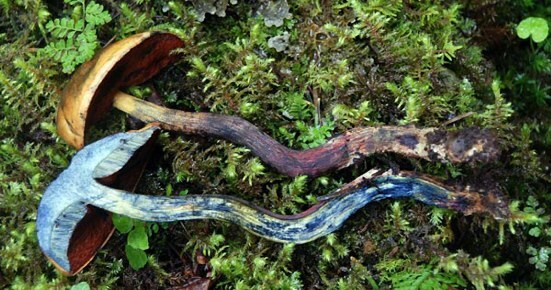 Color Atlas of Wild Commercial Mushrooms in Yunnan. Yun. Sci. & Tech. Press, Kunming (in Chin. ), 133p. Imazeki, R., Otani, Y. and Hongo, T. (1988). 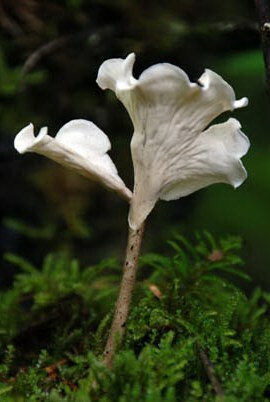 Fungi of Japan (Nihon no kinoko). (Yama-kei Publishers Co. Ltd., Tokyo.) 1-446. Mao Xiaolan, 2000: The Macrofungi in China. In Chinese with Latin names, 719 p.
Google Earth was used for some altitudes that were not taken during the trip.